The perfect truck for those that love an adventure is on its way! Coming in the Summer of 2015, and made for drivers who need a truck to aid them in their off-road travels and extreme-sport related travels, the Ram 1500 Rebel Trim will be the ideal asset. Whether you are utilizing dirt bikes, jet skis, or an array of other powersport toys, the Rebel is incredible for a variety of customers and their needs. The Rebel can be equipped with three engines. First up is a standard 3.6-liter Pentastar V6, with 305 horsepower and 260 pounds-feet of torque. Additionally, it boasts a towing capacity of 7,600 pounds and maximum payload of 1,900 pounds. Available is a 5.7-liter Hemi V8 engine, with 395 horsepower, 410 pounds-feet of torque, as well as a towing maximum of 10,650 pounds and payload capacity of 1,820. Finally, there is a great 3.0-liter EcoDiesel, with 240 horsepower, 420 pounds-feet of torque, a towing capacity of 9,200 pounds and payload maximum of 1,610 pounds. The Rebel boasts a multitude of modifications which set it apart from the 1500's other trims, including an air suspension system which raises the ride height by an inch, a close-cropped steel front bumper that offers an improved arrival angle, 360-degree tow hooks, and replaceable center skid plates - all of which increase the Rebel's off-road performance. The Rebel boasts an aggressive and unique exterior style, with an eye-catching grain-finish grille with billboard-sized tailgate lettering. With dual exhausts, black-bucket headlamps featuring LED accents and matching LED foglights, unique badges which adorn the whole vehicle, a tonneau cover with stamped logo, and blacked-out taillamps, the Rebel will stand out no matter where it goes. The 1500 Rebel has a distinctive interior, with Radar Red seatbacks and sides which are faced by vinyl surfaces which display badging, contrast stitching, and embossed tread-pattern motif. Keeping with the red theme, there is a matching anodized dash trim, as well as removable carpets, all-weather floor mats, and unique gauge faces. The Ram 1500 Rebel boasts an optional Uconnect infotainment system, with an 8.4-inch color touchscreen display, a reversing camera, a premium sound system, a navigation system, and smartphone integration. In addition, there is USB connectivity, a built in Wi-Fi Internet connectivity, and smartphone integration. 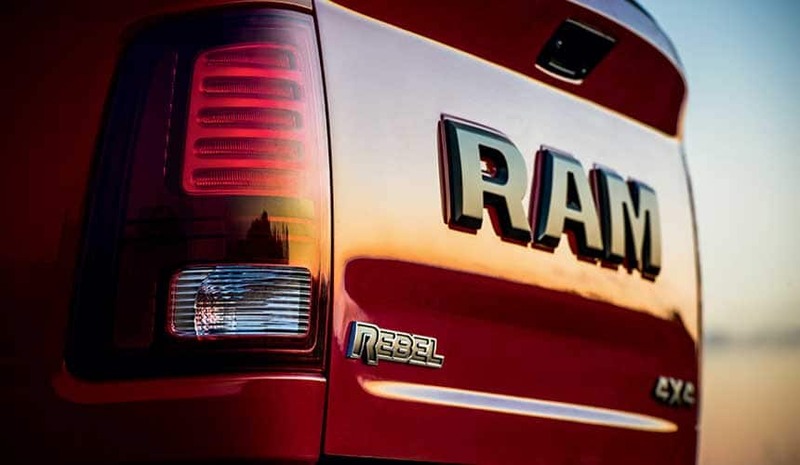 Would you like to learn more about the Ram 1500 Rebel? Give us a call at Reedman, and we would be happy to tell you more about the great truck coming out this summer! Learn more about this model on the Official Ram 1500 Rebel Website.